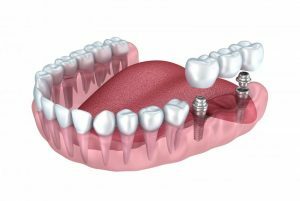 Are Dental Implants in Federal Way the Best Option for Missing Teeth? You’ve been without your teeth long enough to understand how much of an inconvenience it is. After all, you can’t eat the foods that you love, your speech has been altered and you’ve lost a great deal of confidence. Your local dentist says there are other problems that come along with prolonged tooth loss, which will be discussed later. There’s a remedy, though – dental implants in Federal Way. As you read on, you’ll learn more about the process. A dental implant is a surgically inserted post that acts as a replacement for your missing tooth roots. This is accomplished by the titanium-made post being affixed to your jawbone, where it later fuses with the existing bone to form a sturdy foundation. After an initial period of healing, your dentist will invite you back to his or her office to place an abutment, which acts like an anchor for whatever type of attachment will be added, whether that’s a crown (for one tooth) or a bridge (for several teeth missing in a row). Following another healing period, you’ll go back into the office to receive your permanent fixture, leaving fully restored! Why are Dental Implants Considered to be the Gold Standard? Because the implant is affixed to your jawbone, it causes the continued production of new bone material. Thus, you’ll experience better facial integrity. The support for your facial structure provided by dental implants also ensures that you’ll have a natural smile and better overall appearance. Have you been forced to give up your favorite foods because of your missing teeth? With your new implants and permanent fixtures that attach to them, you’ll be back to enjoying life to the fullest! Is it harder to speak clearly without your teeth? Dental implants will once again give you a chance to pronounce words correctly and clearly. A final issue that can be avoided by receiving a dental implant is that you’ll prevent the shifting of your other teeth. Your ivories maintain their position based on a healthy amount of tension that each applies to the teeth surrounding it and the one either under or above it. When that delicate balance is lost, you’ll eventually have some shifting. Your teeth are integral parts of your life, so don’t hesitate to get the help you need while you have enough healthy bone available for your dental implant to seat properly. To learn more about the process, reach out to your dentist in Federal Way today! Dr. Drew Beaty became a dentist to “change the quality of people’s lives by improving their general health.” A graduate of Northwestern University in Chicago, he keeps his skills sharp by attending over 100 hours of continuing education courses yearly. Recognized as a “Seattle Top Dentist 2009 through 2016,” Dr. Beaty can be reached for more information through his website. Comments Off on Are Dental Implants in Federal Way the Best Option for Missing Teeth?